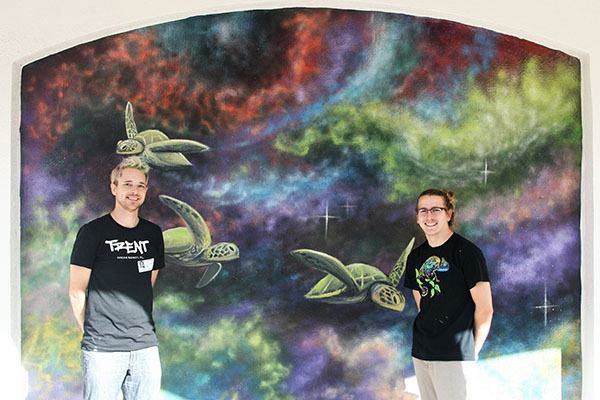 Nick Ringelstetter and Kole Trent in front of the completed “Sea Turtles In Space” mural at Wellington Landings. 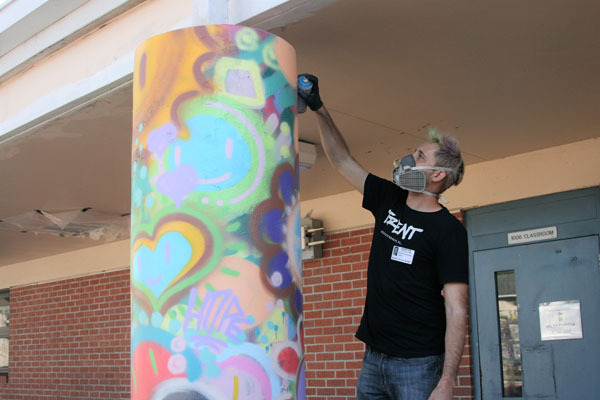 At Wellington Landings Middle School, the growing fine arts program is about more than putting a brush to canvas. 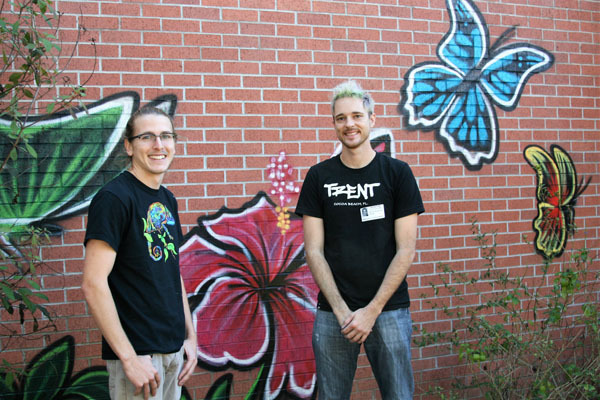 All of last week, the school hosted two talented, up-and-coming artists, Kole Trent and Nick Ringelstetter, giving them the campus itself as a platform to create original works of art. 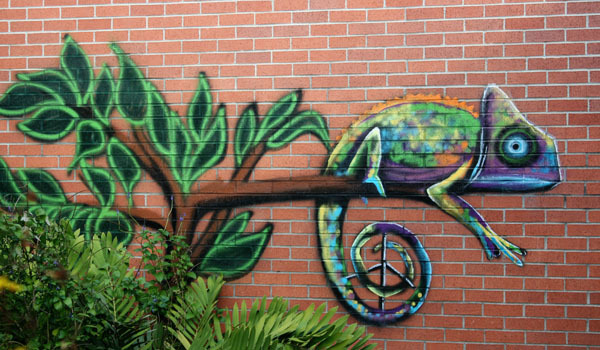 The plan worked, and now instead of the original idea for one mural by one artist, there are now 10 different, unique art pieces on display throughout the campus. 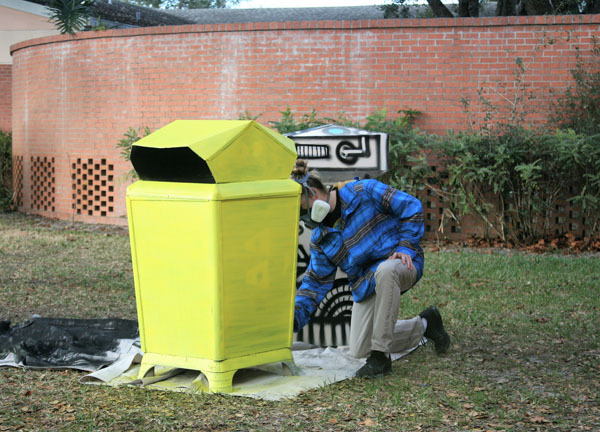 From brick walls to garbage cans, Trent and Ringelstetter have transformed the campus and put artwork in place to reach every demographic within the school. 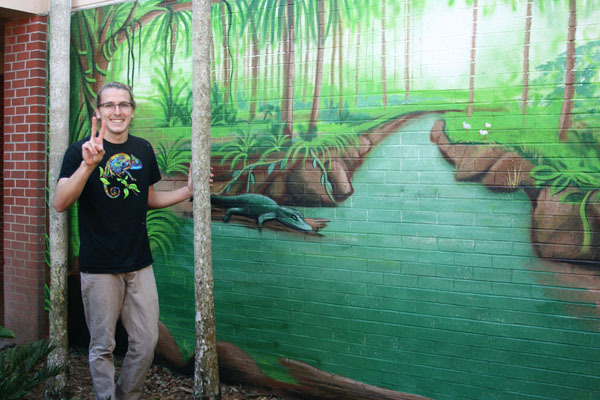 The first mural commissioned was a full wall depicting a natural scene of the Everglades. The piece was meant to accent the existing Positive Behavior Support Garden, but it did not take a week as anticipated. The pieces by Trent and Ringelstetter are meant for long-term enjoyment and inspiration. All the work is made with exterior and UV weatherproof paints, and the art is sealed with a clear coat to protect it. While the artists met two years ago and have crossed paths many times at art shows, it wasn’t until they ventured to Art Basel in Miami that they began a plan for collaborative work. The internationally renowned shows are a driving force in the art world across the globe. The “Sea Turtles In Space” mural is their first collaboration, and right now they both have work on display at a gallery in Cocoa Beach. The space background was first layered down by Ringelstetter, then Trent came in and added the green sea turtles. Both young artists are self-taught, self-proclaimed doodlers back in school, but the similarities in their backgrounds ends there. Trent is a Florida native, while Ringelstetter hails from Wisconsin. Trent’s parents were always big supporters of his work and encouraged him to make a life of it. Even his brother, Kyle Trent, switched career paths to take over as manager for the business. Meanwhile, All the attention from the students made the artists feel like superstars. The scope of the project caught even school officials by surprise. The inspiration reaches beyond schools, as cameraman and friend Jamaal Eveillard shares. He is documenting Trent’s journey through the ranks of the art community. The ultimate goal of this mural tour is 18 different projects, in reference to Trent’s lucky number. “We believe in starting with the younger generations and let them see our work and grow into it and be creative,” Trent said. As their current tour schedule evolves, the artists plan to branch out of Florida and work their way across the country. For more information about the work of Kole Trent and his gallery, visit www.backsideart8.com. Learn more about Nick Ringelstetter at www.atomic7studio.com.